Next you'll see DETAILS of the seats one by one. 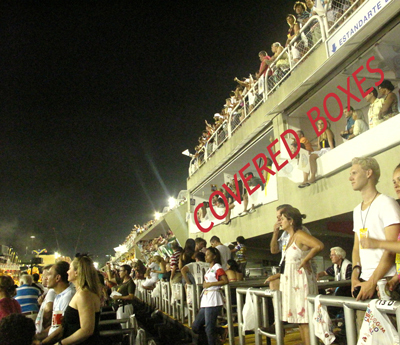 Also known as suites, COVERED BOXES are the most desired seats. They offer great view because of their proximity to the avenue. Also, because they consist of wall-partitioned compartments, they are private. In addition, they are the only set of seats to offer buffet , drinks and other VIP services to their clients. COVERED BOXES are found in the best locations along the avenue (in the standard sectors: 2 through 11). 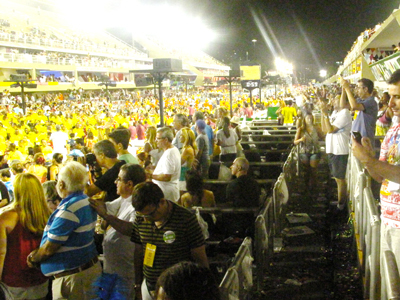 At CarnivalService.com you can buy individual seats in our exclusive COVERED BOXES. OPEN BOXES differ from the covered boxes in that they are in the open and are not separated by wall partitions. Technically speaking, if you use theatre terminology, they are more similar to "front stalls" than to "boxes". OPEN BOXES share with the covered boxes the atmosphere of privacy and exclusivity but they are much closer to the avenue. In fact, you are as close to the beat as you can get and at the same time your privacy is granted. 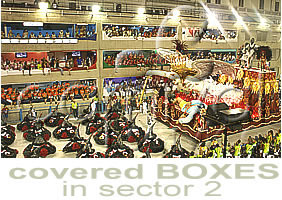 OPEN BOXES are available in all sectors but sectors 1. 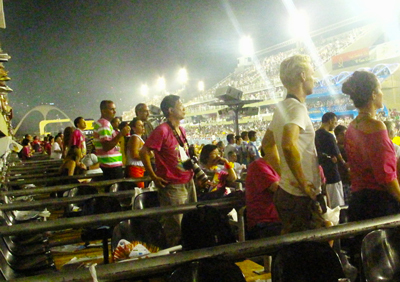 At CarnivalService.com you can buy individual numbered seats in our exclusive OPEN BOXES. 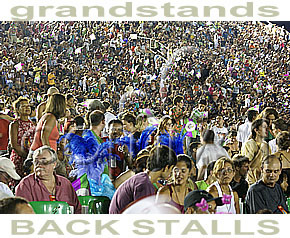 Grandstands seats are the most popular of all seats: they make the "heart of the beat" above the ground. There you will get in direct contact with the local people and with the genuine cheerers for the Schools. If you are fit and don't mind sitting on the concrete ground, that's the place to stay on. You'll find grandstands in all sectors but notice that there are 3 types of grandstands - SPECIAL, TOURIST and POPULAR - and not all of them are available in all sectors. (see below). Only the popular ones have the lowest prices among the tickets for sale and they are located at the very end of the parading grounds, next to the Apotheosis Square. 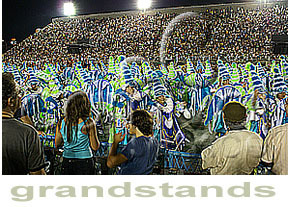 At CarnivalService.com you can buy SPECIAL and TOURIST grandstand seats. BACK STALLS seats are the 2nd type of uncovered foregrounds seats, the first ones being the OPEN BOXES or FRONT STALLS. In fact, BACK STALLS are placed between the OPEN BOXES and the GRANDSTANDS and consist of numbered plastic seats placed on platforms. They are available only in sectors 12 and 13. BACK STALLS have the 2nd lowest prices for the parades and are definitely good value for a low budget. At CarnivalService.com you can buy individual back stalls seats. PRICE RANGE: the second lowest prices! 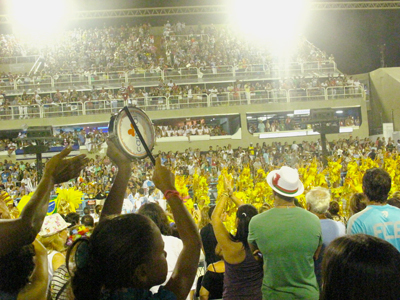 Now that you know all about parades, locations and seats, you are ready to proceed to our SHOPPING section: check our CARNIVAL 2020 PRICE LIST and get your RIO CARNIVAL TICKETS!